Marilyn Holsing’s drawings are still up for another week at Gallery Joe in Philadelphia, in an exhibition that gives an imaginary account of the life of an adolescent Marie Antoinette. “Further Tales of Young Marie Antoinette,” is a compelling exhibition, beautifully curated, where the works not only impress you with their uniqueness of vision and technique, but manage to evoke tangible unease and discomfort. 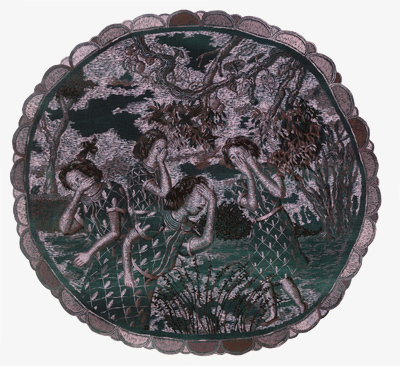 The exhibition is composed of a series of drawings in acrylic on paper, depicting outdoor scenes of a young girl and her group of gossipy friends, and two large dioramas of cutout drawings with visual effects and sound. One of the most captivating aspects of this series is how the work invites the viewer to think differently about drawing. Holsing composes each image using small, repetitive lines, mimicking embroidery. So the drawings, in their subject and content, have the effect of illustration, while the medium and the technique give them the feeling of an old world of carefully preserved decorations and memorabilia, of miniature icons mounted on warped wooden panels. The two dioramas set up in the vault of the gallery are more dramatic, and reminded me of the awkward stage set of a play that keeps repeating itself, a play without beginning or end. The vibrant colors of the pastoral images, the precise paper cutouts and the carefully constructed paths, are not intended to make the images real, but to take the viewer into an imaginary world, where time has no real purpose; a world that keeps spinning around itself: the symbol of Marie Antoinette suspended in time. Satire is perhaps the main, implicit, achievement of these works. The artist plays with images and experiences suggestive of the nasty and unsettling side of becoming a teenage girl, which become titles as well as the points of departure for each drawing: The Nail Biters, Mockery, Mistaken, and Convention. Marie Antoinette is not necessarily set apart, but she is manipulated within her context. The similarity between the figures is disturbing; the individual is the multitude and the multitude the individual. The faces and bodies are all the same, suggesting a multiplied Marie Antoinette. She stops being a unique persona, and becomes the symbol or the idea of a free spirited girl both loved and hated, followed and set out alone, and who will face an uncertain and perilous future. The “Further Tales of Marie Antoinette” is the story that did not yet happen, but it is suggestive of the kind of life a young girl in that position might have had. Marie Antoinette is a metaphor for tragedy, self-destruction, over control or out of control. The drawings not only point to the ominous future of Marie Antoinette, but also suggest her mischievous character, and perhaps the particular darkness that can find it’s home in a young girl’s life.